The Indian constitution is the longest written constitution in the entire world. It was crafted by a constituent assembly with Dr. B.R. Ambedkar as chief. The constitution is our country’s highest form of law. Even the parliament cannot override it. They can however make amendments. Before the constitution was adopted, we were known as ‘Union of India’. After 26th November 1949, the country became ‘Republic of India’. The constitution replaced Government of India Act, 1935 as the country’s fundamental governing document. We celebrate its acceptance every year on 26th January. Let me give you a basic understanding of the structure of the constitution. Our constitution, at the time of its adoption, consisted of 395 articles in 22 parts and 8 schedules. Currently, there are 395 articles. However, if new articles are to be added in a particular part, then the no isn’t changed. It is added under a subheading like Article 23a. In addition to these, the constitution also has 100 amendments and two appendices. The Indian constitution is quasi-rigid which means that it can be modified by addition, variation or repeal (annul). This is because even if an Article of Indian Constitution is deleted, like 131(A), then the next article would still be called Article 132 so that the rest of the articles do not need to be re-indexed. 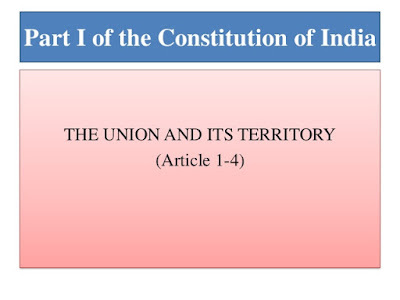 Union and its Territory is covered under Part One of the Indian Constitution under Article 1 to 4 of the Indian Constitution. Today we will talk about Articles 1 to 4 which come under Part -1 of Indian Constitution. (1) India, that is Bharat, shall be a Union of States. (2) The States and the territories thereof shall be as specified in the First Schedule. Article 2a: Sikkim to be associated with the Union. Article 4: Laws made under Article 2 and 3 to provide for the amendment of the First and the Fourth Schedules and supplemental, incidental and consequential matters. Here, the first thing that is basic and of importance is that the name of the country is stated as ‘Union of States’ instead of the expression ‘federation’. In the constituent assembly, it was decided in favor of describing the country as a union, even though the constitution is federal in structure. The reason given for this was that even though the country and people are divided into different states for administrative convenience, the country as a whole is one . The next basic thing is the difference between the terms, ‘Union of India’ and ‘Territory of India’. In simple words, the former covers a smaller region as compared to the latter. ‘Union’ covers the states of India which come under the federal system whereas ‘Territory’ includes the States, Union Territories and such others. It included all the regions over which Indian sovereignty is exercised. The government can acquire new territories through different methods. Now, Article 1 states the name of the country as India that is Bharat and refers to it as a ‘Union of States’ and not as 'Federation of States'. After that, it refers to the list of the states and the Union Territories or any other acquired territories which is included in the First Schedule. Currently there are 29 states and 7 Union Territories whose names are stated in the First Schedule. Part- A: 9 provinces which were under the British rule. The second article is pretty straight forward. According to this, the parliament can admit new states into our country by law under appropriate conditions. For example, the state Sikkim was added by the 35th and 36th amendment acts. This article concerns the change of names, boundaries etc. of a state. The area of a state can be increased or decreased but no part can be acquired by a foreign state/country. The bill to achieve this cannot be introduced in the parliament in either of the two house except on the recommendation of the President. Also, the proposal that contains the change in name, area or boundary of a state has to be sent to the respective state legislature for expressing their views. The legislature will then give its recommendations within a specific period of time. This answer will only be an opinion and might not change the mind of the President or the Parliament. That means that the opinion of the State Legislature is not binding on the President or the Parliament and just seeks to know the will of the people of that State as the State Legislature is comprised of that state people's representatives. 1. A new state can be formed either by uniting two or more states, uniting a union territory with a state, separation of territory from any state. 2. Increase or Decrease the area of any existing state. 3. 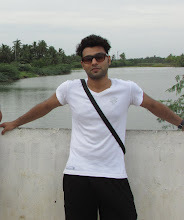 Can change the extent of boundary of any state. 4. Can change the name of any state. This article states that if a new state is added or alteration is made to any aspect of an existing state, then the bill can be passed with simple majority without resorting to any special measure or procedure. This means that if new states are established in accordance with Article 2 of Indian Constitution or any changes are made under the provisions of Article 3 of Indian Constitution then those changes will not be considered as amendments of Indian Constitution under Article 368. This means that in order to effect these changes only a simple majority of the Parliament is required.